The YXLON MU56 TB industrial X-ray system is developed and suited for non-destructive testing of turbine blades and aircraft parts. The robot system helps to make objective inspection decisions and can be integrated easily into the production process. Testing of safety critical parts in aerospace industry like turbine blades is subject to strictly testing requirements. The robot system YXLON MU 56 TB fulfills applicable industry standards like ASTM, MAI and Nadcap. Manipulation of inspection parts is done by an industrial robot which assures exactly positioning and fast cycle-times and automatic tool changing allows easy testing for a variety of inspection parts. The variofocus X-ray tube and the digital flat-panel detector deliver best image quality and the variable focal spot size is perfect for applications with highest requirements for image quality as well as for high power applications. Thus, the preconditions to meet the high safety standards in aerospace industry and increasing efficiency and quality in the production process were fulfilled. Y.PXV5000 software is a core element of this YXLON X-ray system and ensures fully automatic control and image analysis during inline X-ray inspection. The image processing software Image3500 supports the user with different test modes, intuitive user guidance and functions like image quality testing according to ASTM E2737. The testing process can be optimized further with optional features. 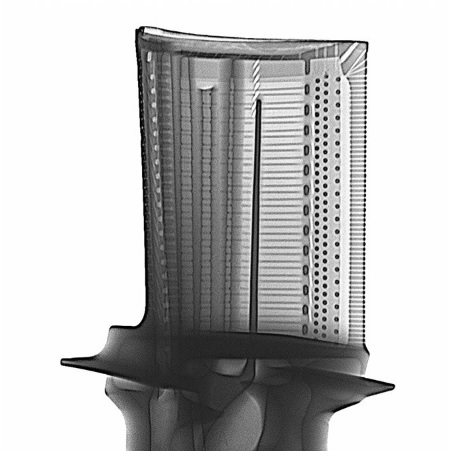 YXLON AdResult software archives and records X-ray images to create production statistics. With the review workstation the user can analyze and evaluate X-ray images while the system is working in automatic mode.